'Doll Pretty' (Les Peterson, R. 1973) Seedling #LP 72-1. IB, 20" (51 cm). Early bloom. 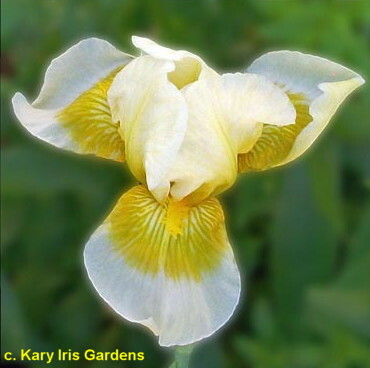 Standarads white, tinted yellow at base and midrib; falls medium yellow-white, yellow at hafts extending to full third of petal, outer portion white with turned-up effect at end; deeper yellow beard. 'Green Spot' X 'Lady of Nepal'. Peterson 1973. Honorable Mention 1977. From AIS Bulletin #210 July 1973 Introducing DOLL PRETTY. (Green Spot X Lady of Nepal). IB. 20". E. Perky and pretty describes this cute intermediate bearded. Standards white, tinted at base and midrib with inner or haft color of falls which are medium yellow-white, yellow at hafts extending to full third of falls. Outer portion of falls white with perky turned up effect at end. Deeper yellow beard. Fast increaser ideally suited for border. $10.00. Les Peterson.